Mark Harris addresses supporters Tuesday night during his victory party. Challenger Mark Harris defeated incumbent Republican Congressman Robert Pittenger by a margin of 814 votes. This was round two for the Southern Baptist pastor and the Congressman – Harris barely lost to Pittenger two years ago. But Tuesday’s primary is just a first win in a longer battle. Harris will face well-funded Democratic challenger Dan McCready in the general election. 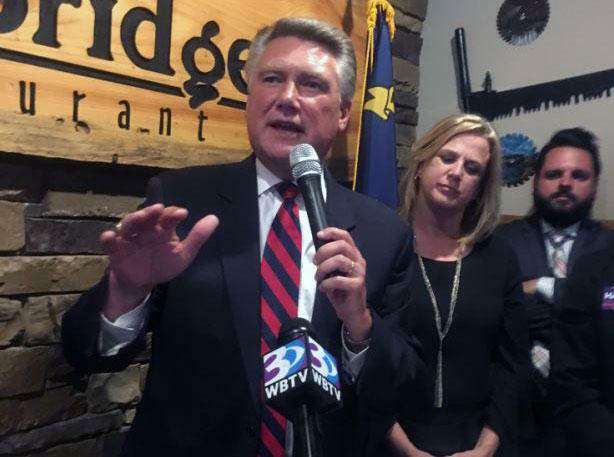 The overcrowded restaurant in Indian Trail was euphoric as Harris announced his win over Republican incumbent Pittenger. But amongst the celebration, was a heavy dose of reality. Supporters know that Harris faces a stiff challenge from McCready, the candidate who the National Democratic Party is throwing its support and money behind in an effort to turn District Nine blue. Building that “red wall” takes money that Harris doesn’t yet have. As of late April Harris only had about $71,000 left in his campaign, according to the campaign finance tracking website Opensecrets.org. McCready had about $1.2 million. The 9th district, which President Trump carried two years ago, stretches from south Charlotte to Fayetteville. Harris said he will continue to align himself with President Trump’s conservative agenda. “I think the President has given us a tremendous agenda and I think we ran on that agenda in the primary and I see no reason to change that agenda moving forward into the fall,” Harris said. Harris means an anti-establishment agenda that seeks to replace career politicians and decrease the size of the federal government. “We ran this campaign on a theme that we wanted to have less of Washington D.C. in the 9th district and more of the 9th district going to Washington D.C.,” he said. It’s the Pro-Trump rhetoric, like the chants of “drain the swamp” that filled the restaurant that energized Gregory Paulis. Anti-establishment anger helped Harris win the race, said Larry Shaheen, a consultant for Pittenger’s campaign. With final results coming in just after 10 p.m. three term congressman Pittenger conceded. “All the people who stood with me, thank you so much for all you’ve done to support this congressman and our effort to give leadership in this country,” he said. Pittenger also closely tied himself to President Trump. And Vice President Mike Pence was in Charlotte to campaign for him last month. After a campaign where Harris heavily criticized Pittenger, Harris spent a good part of his victory speech praising and thanking the Congressman for his service. In addition to money, Harris said he’s going to need Pittenger’s support to win in November.